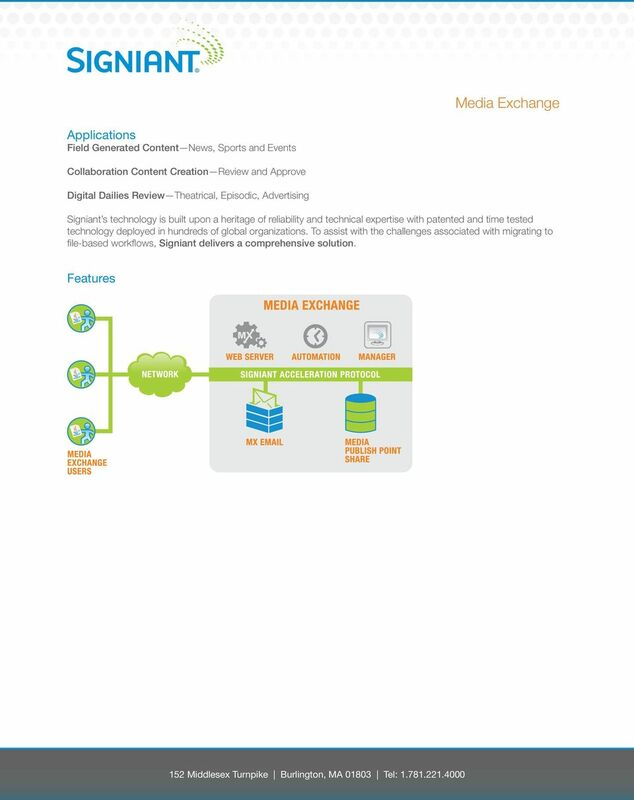 Media Exchange really puts the power in the hands of our creative users, enabling them to collaborate globally regardless of location and file size. 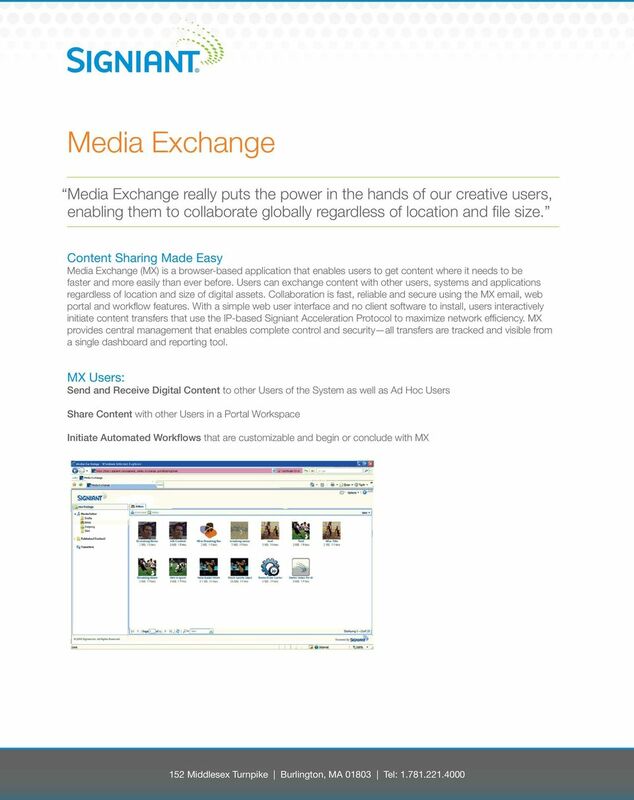 Download "Media Exchange really puts the power in the hands of our creative users, enabling them to collaborate globally regardless of location and file size." 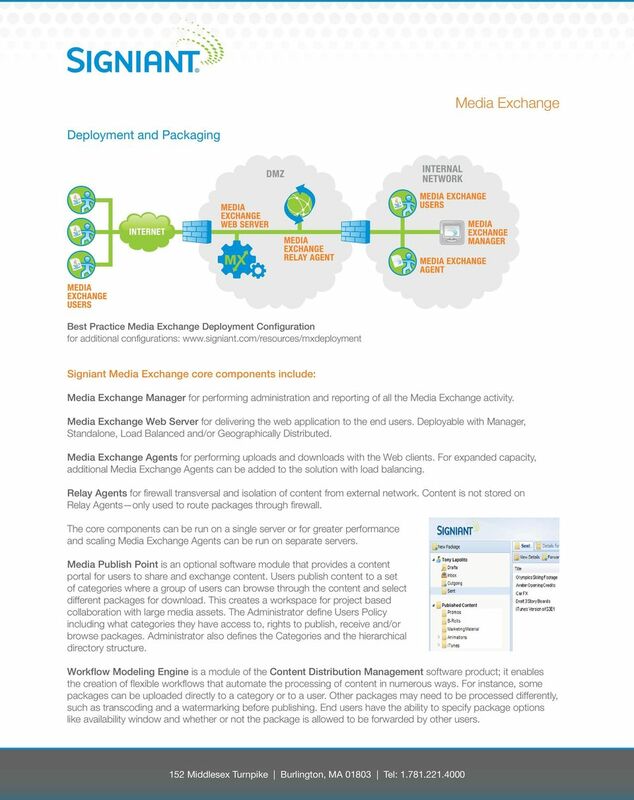 4 Deployment and Packaging Best Practice Media Exchange Deployment Configuration for additional configurations: Signiant Media Exchange core components include: Media Exchange Manager for performing administration and reporting of all the Media Exchange activity. 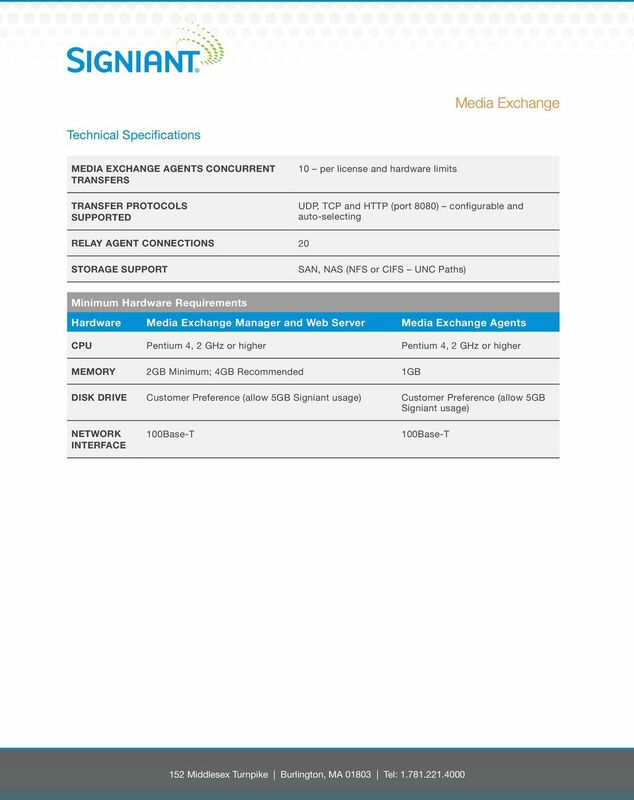 Media Exchange Web Server for delivering the web application to the end users. Deployable with Manager, Standalone, Load Balanced and/or Geographically Distributed. 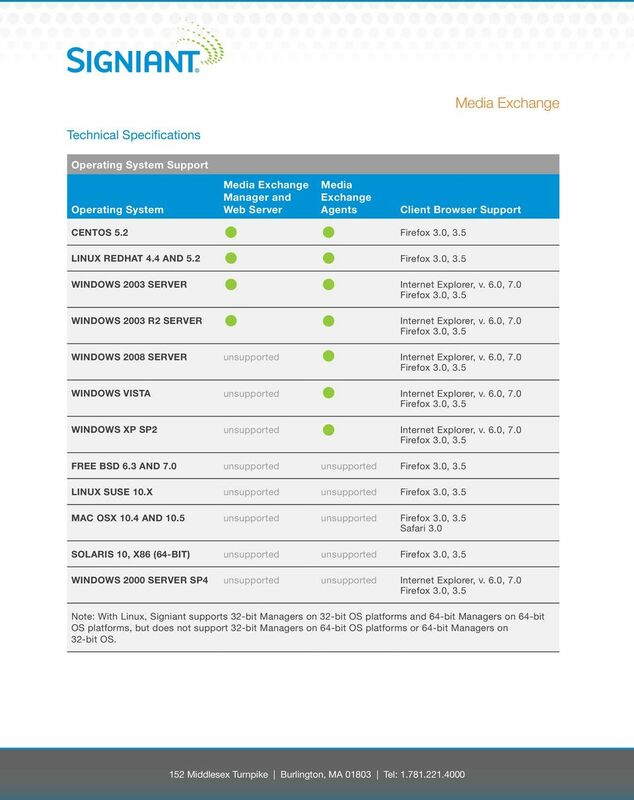 Media Exchange Agents for performing uploads and downloads with the Web clients. 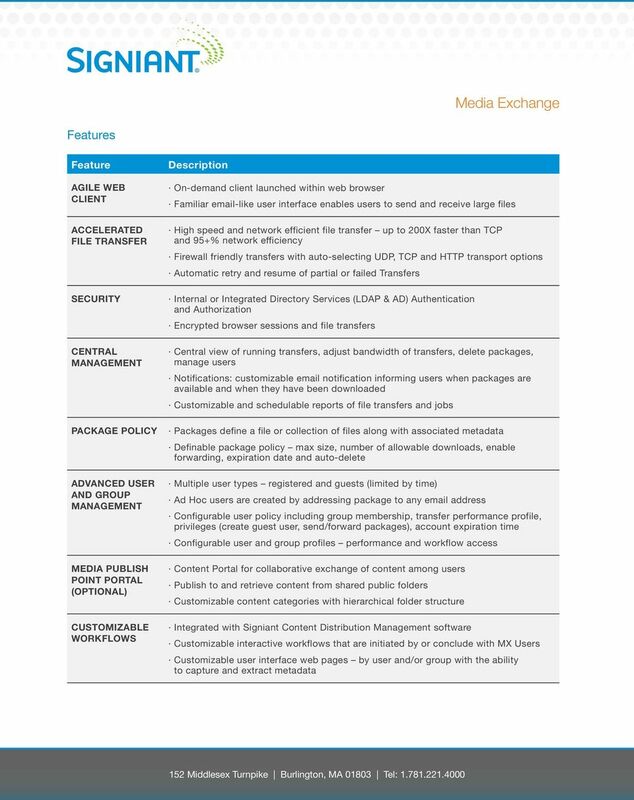 For expanded capacity, additional Media Exchange Agents can be added to the solution with load balancing. Relay Agents for firewall transversal and isolation of content from external network. Content is not stored on Relay Agents only used to route packages through firewall. The core components can be run on a single server or for greater performance and scaling Media Exchange Agents can be run on separate servers. Media Publish Point is an optional software module that provides a content portal for users to share and exchange content. Users publish content to a set of categories where a group of users can browse through the content and select different packages for download. This creates a workspace for project based collaboration with large media assets. The Administrator define Users Policy including what categories they have access to, rights to publish, receive and/or browse packages. Administrator also defines the Categories and the hierarchical directory structure. Workflow Modeling Engine is a module of the Content Distribution Management software product; it enables the creation of flexible workflows that automate the processing of content in numerous ways. For instance, some packages can be uploaded directly to a category or to a user. Other packages may need to be processed differently, such as transcoding and a watermarking before publishing. End users have the ability to specify package options like availability window and whether or not the package is allowed to be forwarded by other users. 6 Technical Specifications Operating System Support Operating System Media Exchange Manager and Web Server Media Exchange Agents Client Browser Support CENTOS 5.2 LINUX REDHAT 4.4 AND 5.2 WINDOWS 2003 SERVER Internet Explorer, v. 6.0, 7.0 WINDOWS 2003 R2 SERVER Internet Explorer, v. 6.0, 7.0 WINDOWS 2008 SERVER unsupported Internet Explorer, v. 6.0, 7.0 WINDOWS VISTA unsupported Internet Explorer, v. 6.0, 7.0 WINDOWS XP SP2 unsupported Internet Explorer, v. 6.0, 7.0 FREE BSD 6.3 AND 7.0 unsupported unsupported LINUX SUSE 10.X unsupported unsupported MAC OSX 10.4 AND 10.5 unsupported unsupported Safari 3.0 SOLARIS 10, X86 (64-BIT) unsupported unsupported WINDOWS 2000 SERVER SP4 unsupported unsupported Internet Explorer, v. 6.0, 7.0 Note: With Linux, Signiant supports 32-bit Managers on 32-bit OS platforms and 64-bit Managers on 64-bit OS platforms, but does not support 32-bit Managers on 64-bit OS platforms or 64-bit Managers on 32-bit OS. Enterprise Software Lets Users Move Large Media Files Fast and Securely. Cloud-Delivered Software Lets Users Move Media Fast Without File Size Limits or Security Risks. Technical Best Practices 8.7 Software Upgrade Upgrade to Webtrends Analytics 8.7: Best Practices Version 3 Webtrends Analytics is a powerful application that must be installed on a dedicated computer. VMware Horizon Mirage Installation Guide Horizon Mirage 4.3 This document supports the version of each product listed and supports all subsequent versions until the document is replaced by a new edition. Cross-channel protection GSelector s exclusive cross-station protection prevents the same song from playing at the same time across your stations. System Manager 1.1 Customer Presentation Feb 2010 Agenda Overview IT challenges and solutions Business challenges and solutions Features and benefits Availability, licensing and requirements 2009 NetApp. System Management. What are my options for deploying System Management on remote computers?